Evergreen Writers Group meets the first Wednesday of each month from 10:15 am to 12:00 pm at Evergreen House, 26 Newcastle Street, Dartmouth. Evergreen Writers Group welcomes newcomers to our meetings. We get together for discussion, encouragement, and provide feedback to each other on works in progress, guest speakers, and workshops. Guests who have mobility issues should use the lower side door. For more information, call 902-463-5612 or email. This is a private booking. The Museum is open to the public except for the Green Parlour, which is unavailable. Learn more about facility rental opportunities at the Dartmouth Heritage Museum here. Celebrate St. Patrick’s by joining us at the beautiful historic Evergreen House on March 16 for a lovely afternoon tea. 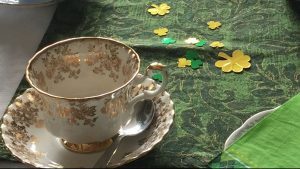 We are delighted to host storytellers Elinor Benjamin, Liz Newkirk, and Linda Winham to regale you with Celtic tales just in time for St. Patrick’s Day. The menu includes fresh scones, cookies and, of course, piping hot tea. Nut-free event. Tickets are $12.00 for adults and $5.00 for children. They are now SOLD OUT.